Superboy is injured, the team is stunned, Rako stands triumphant. Shaking off the shock of an injured Teen of Steel they attempt to defeat the warrior only to be taken out by a falling tapestry. When they finally escape the embarrassing trap they find that Trang has been killed. Later at Bibbo's diner, the team telepathically and via smartphones put together the clues. Everyone in the photo from Shirley Mason is identified except for Nate Adams, General Eiling, the judge at Adams trial and a young boy. Deduction of clues reveals the boy to be Rako, all grown up. Rako was now an assassin with loyalty to Trang and missing C.I.A spook Alec Rois. Piecing clues together they deduce that Rako and Rois must have realized the Covert Justice League was investigating and used the photo as a hit list. Yarrow and Polk are the only survivors left, time being short, the team splits to end the case. Superboy, Robin and Kid Flash are too late heading to Vegas and arrive only in time to watch a horrific explosion kill Yarrow. The only thing the explosion confirms is that Rako & Rois are working together as they guessed identifying Yarrow from a tattoo they head to St. George to rendezvous with the rest of the team before Polk dies too. The team walk into a hangar only to find Rako, Rois and the big boss - Yarrow! Yarrow reveals that legally 'dead' Rois was holding a trigger switch rigging the hangar to explode. 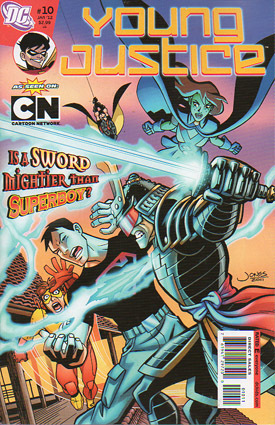 The incessant chatter lays Superboy's fears to rest when Yarrow points out that Rako's sword was made of a specially engineered metal that could hurt even Superman. The chatter costs him dearly and he notices too late that Robin wasn't with the rest of the team. Enter Robin. The tide turns as M'Gann, Artemis and Kid Flash incapacitate Rois and Aqualad battles Rako with his water based abilities. Robin stares death in the face as bullets from Yarrow's gun hurtle with pinpoint accuracy directly at him. Superboy leaps in with lightning speed and a ricochet hits Yarrow. M'Gann uses her mental powers on Yarrow before he dies to reveal the truth of that fateful night. At debriefing, the team reveal how Adams was set up. How nearly everyone besides Adams and Eiling were all co conspirators drugging Adams and framing him for the murder. Eiling drives Captain Adams to Honolulu and smiles at his friend who reveals that Nate Adams was in fact Captain Atom all along. With the mystery solved Adams admits he had always thought Eiling was not an innocent party but had changed is opinion after everything the super teens had revealed to him. The story would usually be over now, a happy ending, blah, blah! Instead in Washington later we discover that Yarrow had taken the blame for everything but in fact something everyone had overlooked was that someone had taken the photo that Shirley Mason had kept hidden - that someone, was Eiling! His reuniting Adams with his children had made Eiling and Captain Atom best friends and nobody would ever find out the truth now. Eiling grins that Captain Atom being on his side means that he has a trump card to play. Story - 5: This book is amazing, take notes DCnU writers, this is how you write an engaging book. The only fault I can find with it is that despite the overview by Robin, the mystery was still difficult to follow all the set up threads were last month. Art - 5: Faring far better this time round Christopher Jones is delivering some the genuinely cool layouts. Very enjoyable art that furthers the link that the writers established with the series and the comic. Cover Art - 5: A weird part of the book to focus on as the cover as it was a fairly small subplot compared to the much larger scale of the main plot. Still eye catching and shocking, leaving you worrying if Superboy is badly injured. I just wish it carried on the murder theme. Check out the Comic Index Lists for the complete list of Superman-related comics published in 2012.